With most of these issues, the big danger is that leaving it too long will make the matter worse. For instance, you might end with the rain forming a damp patch on your wall or causing some other sort of damage. By getting the gutter fixed as soon as you can, you could also save some money by solving the problem before it becomes a bigger and more expensive repair job. There are a few important factors that will determine how much you can expect to pay in terms to fix your guttering. The first one is, obviously, the work needing done. It is clear that cleaning out debris is going to cost a lot less than replacing a whole section of damaged guttering. Cleaning out debris normally costs around £5 per metre of guttering. You should also be aware than in London costs are typically higher, while in the North of the UK it should be cheaper. Refitting or replacing an existing piece of PVCu guttering should cost around £33 per metre. If the gutter is cast iron then the costs rises to about £57. If it’s the downpipe that needs to be fixed or replaced then the cost should be around £24 per metre for PVCu and £75 per metre for cast iron. Other jobs that may be needed include replacing a gutter support bracket (£14), fitting a new leaf guard (£13) and fitting a new stop end (£12). It should be remembered that some jobs could involve a combination of these different tasks. Replacing the gutter joint where two sections meet will cost between £50 and £125. 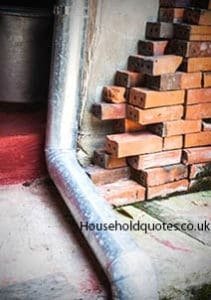 The cost will be about the same for the task of joining the downpipe to the gutter if it has broken away for some reason. Difficult access and especially high roofs can lead to higher prices being quoted. This is why it is important to explain the problem fully and allow the tradesmen the chance to come out to assess the job if needed. The fact that it the job may require working at a considerable height means that most homeowners are happy to let an experienced tradesman take on this job. Even discounting the height issue, the only job that is reasonably suited to DIY work is that of cleaning out debris. This is something that any able bodied person can do they don’t mind getting up a ladder. The rest of the gutter repair jobs all involve some specialist skills and knowledge. The simplest and most effective way of getting the best price for gutter repairs is to look online for a tradesman. There are a few tips worth keeping in mind when doing this. Be wary of any gutter repair quotes that are much lower than the rest, as you need to be careful to avoid scammers and con-men. After you have got a few quotes it should be clear whether any of them need to be discarded for being too high or too suspiciously low. So, how do you choose from the remaining contenders? You can now check out a few online reviews, to get an idea of how satisfied their previous customers have been. Add in your thoughts on how professional and friendly they all are, and you should be able to make a smart choice on which one to use. By doing this, you can forget any worries about your gutters for a while and start to enjoy your home again. Get FREE Guttering Quotes Today! Get Your FREE Guttering Quotes NOW!